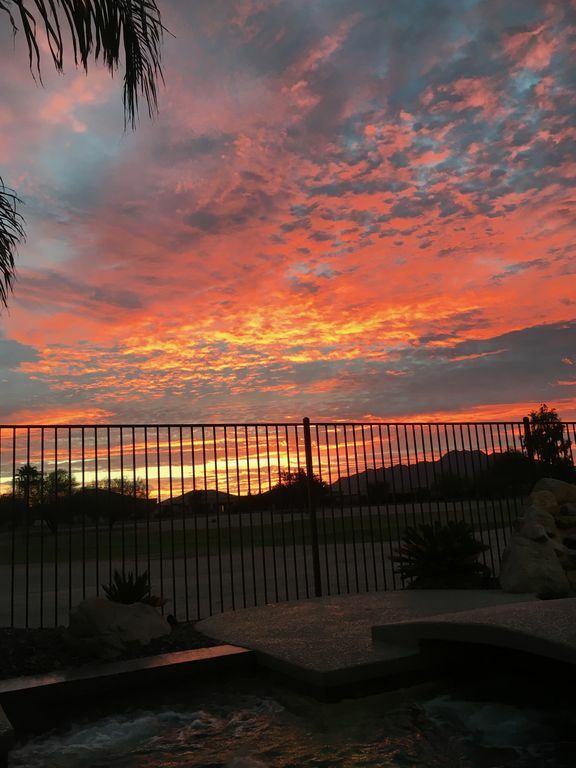 Cette région de Phoenix Location de maison de vacances situé à Chandler peut être votre propre station privée. Le jardin avec une piscine chauffée et spa chauffé est un rêve tropical qui surplombe le golf Lone Tree. Un barbecue et un foyer de verre jouxtent la terrasse couverte. Détendez-vous dans l'eau salée spa santé dans le soleil du matin ou sous les étoiles dans la soirée. Un pont sépare le spa d'eau salée de la piscine d'eau salée et d'une cascade. Profitez de votre café du matin avec une vue sur le soleil levant sur la montagne SanTan. La maison est confortablement meublé avec fauteuils inclinables en cuir de puissance et HDTV grand écran plat et tous les nouveaux appareils de cuisine en acier inoxydable. Chaque chambre dispose d'un téléviseur HD à écran plat et salle de bain complète. Aussi, il est un den / bureau avec un canapé-lit qui peut doubler comme une troisième chambre à coucher et dormir confortablement 4 à 6 personnes. Avec Internet sans fil, il est un endroit idéal pour travailler ou jouer. Il est un emplacement de choix dans une rue calme à proximité des épiceries, boutiques et restaurants. Cette maison est dans un adulte vivant, communauté fermée. We rented this lovely home, which is just a few miles from our winter home, for extended family members during Thanksgiving week. It's very-well kept, nicely decorated, and super clean. The patio, pool, and hot tub are perfect for Arizona weather. The hot tub heats up quickly, the pool takes some time in cooler November night time temps. The waterfall is amazing and the golf course and Santan mountain views certainly complete a sweet vacation package. We'd certainly rent it again! Thanks, Melinda. We would love to have your family back again! We felt like we were at home. The pool was fabulous and we enjoyed the quiet and peacefulness. The morning sunrise was a favorite over the San Tan Mountain. Great location and easy to get to. Hope to go back again. Enjoying the sunrise over the mountain with coffee or in the spa is our favorite, too! Thanks for taking great care of our place! This home was exactly as pictured. The pool and hot tub were heavenly and the views of the golf course and Santan mountains are gorgeous at sunrise and sunset. The recliners in the family room are very comfortable and the tv was great as well. We especially loved the built in grill outside and the fire pit. Cinde was always available by phone or text and always very helpful. There were even spa robes in the walk in master closet! The owners here thought of everything. Loved it!! Thank you so much for the very nice comments and taking such great care of our home, Marcia. We hope it works for you to come back again. We so appreciate all the wonderful reviews we've received. We really enjoy sharing our place with others who love it as much as we do! We rented this house because we could heat the pool and it worked out beautifully for our family. The owners were so responsive and checked on us almost daily. Property was very convenient to shopping and the house was stocked with everything we needed. We will definitely rent here again. The third bedroom is really a den with hide a bed, which was fine for the kids, but with no door the kids woke up early. What a lovely home for a spring break from cold Canada! Communication with Cindie was great from beginning to end. A terrific binder was provided with all the info about the home and pool and some really good suggestions on things to see and do in the Phoenix and Chandler area. Everything we needed to enjoy our stay was available, we especially liked the good variety of spices and condiments. We used the electric smoker one evening, wow, it was easy to use and our tri-tip roast turned out perfectly! We spent lots of time hanging out in the awesome back patio and pool and loved the spa in the evening after a day taking in some spring training games. The house is laid out very well, the neighborhood is great. We have rented several vacation homes and this one ranks right up there at the top. Loved it! The house met all of our needs. We felt very comfortable inside the house and really enjoyed the pool/spa area. Cinde made sure we had all the information we needed when we arrived. She even checked in with us in the middle of the week to make sure everything was ok. We are looking forward to returning again. Proche commerces, restaurants, événements sportifs, randonnées, activités nautiques, à proximité de Sky Harbor et Phoenix Mesa Gateway Aéroports, et le ski est à 3 heures à Flagstaff. Guests will be charged cost of natural gas used to heat pool & spa that will be deducted from the security deposit. A booking fee of $250 to be accessed only if reservation is cancelled.